Dancers kneel in a row, their arms weaving complex patterns as the tempo quickens. Their graceful, rhythmic movements are accompanied by body percussion and distinctive, chanted melodies. This is the striking dance form known as Saman. 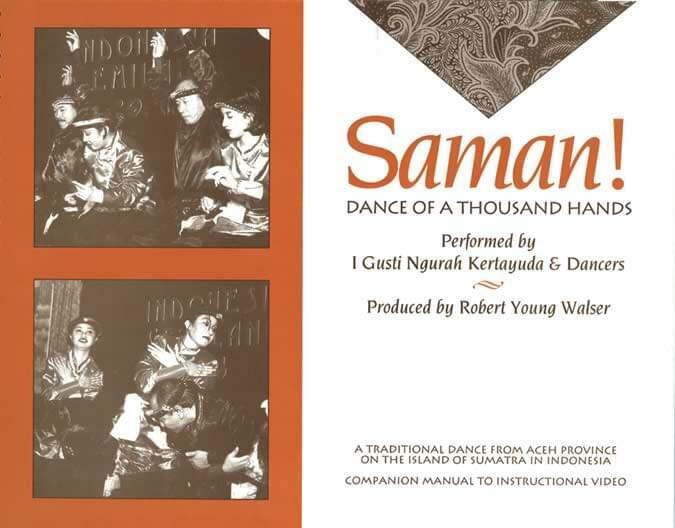 From the island of Sumatra, in Indonesia, Saman is a feast for the eyes and fun for the arms. Students ages nine and older (through adult) will enjoy this unique experience. Audiences will be mesmerized by it. Learning it is easy through this detailed DVD and manual set. Saman! includes cultural background by I Gusti Ngurah Kertayuda, the director of the dance ensemble from the Indonesia Consulate of Chicago, and instructional guidance by ethnomusicologist/music educator Bob Walser.